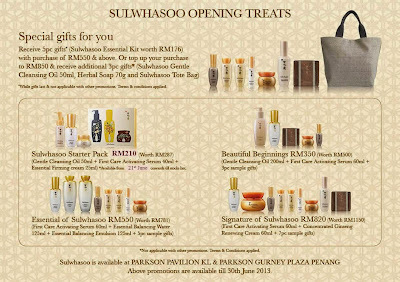 Pacific Amore has just released a new pricing for Sulwhasoo for their opening special. Valid until 30th June 2013. I was planning on getting their starter pack, however it seems that the price has gone up to Rm210 (About 70Aud). I asked my Korean eonni, Sunny who happens to be coming down from Busan next month to check the prices in South Korea. She just reverted to me that they do not have starter packs in South Korea for sale, and the Parkson one currently is considered cheap (after I converted the prices to Australian dollars for her to compare). Maybe they will increase their prices after the promotion period? I am eyeing the Essential Line, and the Hydro Aid range. Keeping an eye out on their promotions. are they really that good? saw some coupon site selling the starter kit too.. Whether it is good also probably depends on the person's skin type and how they respond to the ingredients, I guess. I haven't tried it, so I cant make a judgement call at this point of time, as my experience has been limited to mostly Sothys, Dermalogica, and other French and American skincare line.